Skullcap (Scutellaria lateriflora) is an extremely important botanical, desperately in need of identity standards. Much of the industry, even seasoned herb suppliers, remain unaware that the potentially hepatotoxic Teucrium (germander) adulterates the skullcap market. 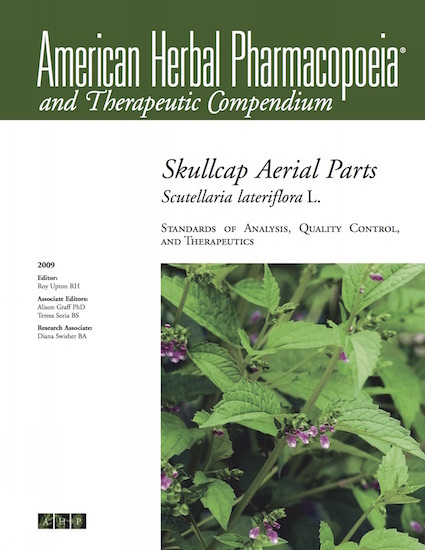 We have also found that other domestic species of Scutellaria, including the aerial parts of Chinese skullcap (S. baicalensis), are being sold as “skullcap,” as well as S. galericulata, and S. incana. Fortunately, these other species are similar in activity, and are not considered to present a toxicity concern. One potential source of confusion is that some seed sources have been reported to be selling the wrong species, leading to cultivation of material that then enters the supply chain. In addition to skullcap being erroneously implicated in liver toxicities, which more accurately is associated with germander, numerous analytical researchers have published constituent findings for skullcap that in fact used an inaccurately named species. This AHP monograph is critical for addressing these issues and, hopefully, will lessen the propensity for Teucrium and other adulterations in domestic and European supplies.